that I haven't done any? Always late to the trend over here. High waisted and/or Skinny jeans are soo not my thing. They just don't like me. Now skinny capris are a different story- love them. But I stay with my regular old boot cut dark denim jeans and am happy. and by that time- trends are on their way out. it must mean that pallet projects have been going on for a few years now. I just wanted that silvery old weathered wood. something like this vintage apple crate. to try and make my own. It was pretty simple to make- AFTER you get the boards off the pallet. Have you ever tried to pry boards off of a pallet? We ended up using a sawzall to cut the boards off and that worked perfect. and a couple little 'legs' if you would like them. voila- your project is finished. created in about 20 minutes. I love that weathered rustic look too! Great job, and beautiful photos, Courtney! I too luv the weathered wood look. Nothing like a nice weathered grey. Pretty and rustic. Luv it. PPsssttt, I am not on the pallet trendy bandwagon either. :-) But I do reuse wood for the frames for my canvasses. You're not alone, Courtney - I've never done a pallet project either. There are some I'd love to do, but I have so many projects going on now, I've just never gotten around to doing one with pallets. I did ask my husband to bring home as many as he possibly could, but that's because we want to use them on our horse corral. 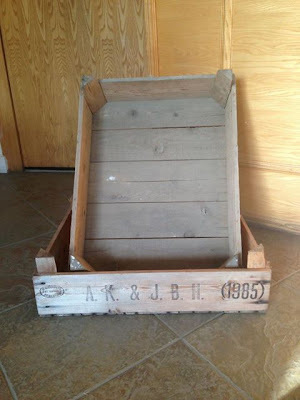 No pallet projects around here, either....your tray is adorable, tho. Very pretty! and your styling is superb - as always! Wonderful nice weathered look. The edges look kind of rough, do they catch on anything (skin, snag clothing)? It turned out really well. Haven't noticed any snagging on anything-they aren't super rough to the touch. I have left them as they were- but you could always sand the edges if they were too rough. What a great job on the tray - looks terrific. I have never made anything with pallets either. The pictures are so good. Enjoy your tea. Gotta love free wood :) It's a qt girl. Knew it would be. Spied your tweet and had to come see! Once you start making stuff with free wood, it's hard to go back. Especially when it's so expensive! Yikes. Our baseboard alone was a zillion dollars. Knew you'd make something darling. It's so you!! That's impressive! At a recent Habitat build I was tasked with pulling nails out of some 2×4s....impossible! I have a pallet outside my garage door. I'd love to make this! So pretty in a rustic way! Super cute! I've never done a pallet project either, so you're way ahead of my. By the way, I had to laugh at your comment about skinny jeans and such...I'm the same way, I like my boot cuts! Hi Courtney, everywhere there is talk about these pallets, but no one says where you can get them. Do you know? Thank you! I think I like them in a boys room.